The Brown Trout is native to the British Isles and is distributed throughout almost every part of the country, although pollution, overfishing and abstraction of water have caused its disappearance from many waters that previously held it in abundance. Few fish show a greater range of variation in colour, shape and size, and it is difficult to believe that the silvery estuary trout is of the same species as the dark specimens which are caught in some mountain tarn. In a few instances these extraordinary variations in colour have given rise to specific names to a local race, as in the case of the Gaillaroo and Lockleven varities; but fish culture has shown that the progeny of these beautiful fish frequently throw back to the normal type of Fario when removed from their own particular locality and that habitat is the chief factor determining, colouration size and condition. 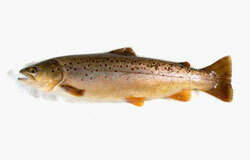 The growth rate of Brown Trout, assumming a suffiencient supply of suitable water, depends almost entirely on the amount of food they are able to obtain and is fairly rapid when it is plentiful; in south country chalk stream, which may be regarded as favourable to growth a well grown specimen would be 5 or 6 inches long when one year old; a two year old from 10 to 12 inches long and at three years should measure from 13 to 16 inches and weigh from 15 to 27 ounces. Subsisting as he does under natural conditions, entirely on a living diet, the brown Trout either in his young or mature stages avails himself of almost every inhabitant of fresh water, from microscopic infusoria to a yearling of his own species, but is at his best when he can obtain a plentiful supply of molluscs, crustaceans, flies and their larvae. Note: The Brown Trout section was written in 1889 by A. R. Peart, Pisciculturist and Engineer, the first proprietor of Berkshire Trout Farm. His words written over a century ago are as valid today as they were then.